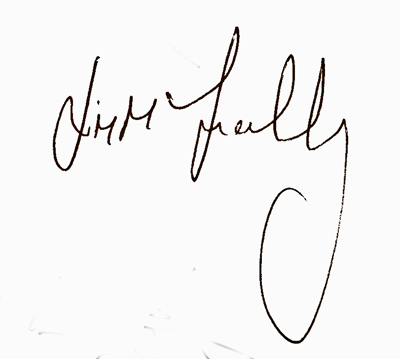 A product of Celtic Boys Club, McInally signed professional forms with Celtic in October 1980. Starting off as a left-back, he won Scotland Youth caps and then debuted in the first team against Dunfermline in August 1982, but would only make another two appearances for the Glasgow club. 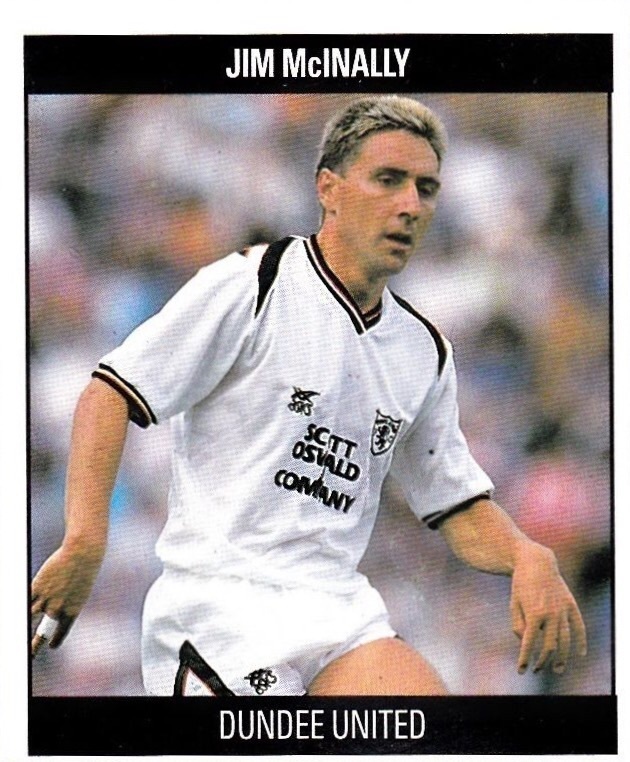 In January 1984 he went out on loan to Dundee, and although offered a new contract with Celtic, Jim chose to join Brian Clough’s Nottingham Forest side in May 1984. Signed on the same day as Johnny Metgod and Gary Megson, Jim made his Forest debut during a pre-season tour of Australia, which was quickly followed by a return to Glasgow to face Celtic, and an appearance in Jim McLean’s testimonial match at Tannadice in August 1984. He went on to make over 40 appearances during his 18 month spell at the City Ground, and on Boxing Day 1985 he was transferred to Coventry City for £112,000. 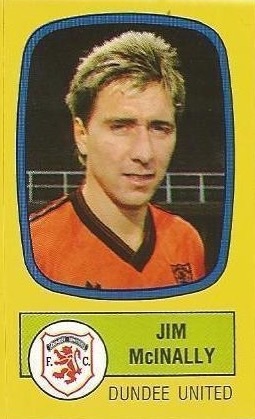 After just five months at Highfield Road, Jim - along with teammate Dave Bowman, who had arrived at Coventry from Hearts a year before McInally – was brought to Tannadice by manager Jim McLean in a joint deal worth £140,000, a deal funded by the transfer of Billy Kirkwood and Stuart Beedie to Hibs on the same day. 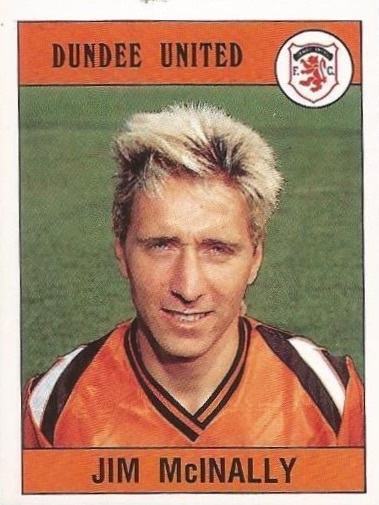 By now a defensive midfield player, Jim made his first appearance for United against Raith Rovers in a friendly in July 1986, but had to wait until September to make his competitive debut against Hamilton Academical. 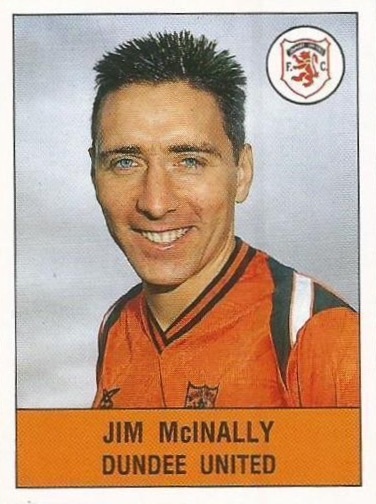 Jim went on to be a regular in the side in his first season, scoring his first goal for the Club against Hajduk Split at Tannadice in the UEFA Cup, and was an influential player throughout that campaign, as United reached the final only to narrowly lose out to Gothenburg. He also collected a runners-up medal in the Scottish Cup after losing to St Mirren at Hampden. He achieved international recognition while he was with United, winning the first of ten full Scotland caps against Belgium in April 1987, and was also capped at Under-21 level as an over age player. A second Scottish Cup runners-up medal followed a year later against Celtic, and in 1991 he was a Scottish Cup runner-up for a third time after United lost to Motherwell in extra-time, a match that saw him, along with three other players, sent off after the final whistle. 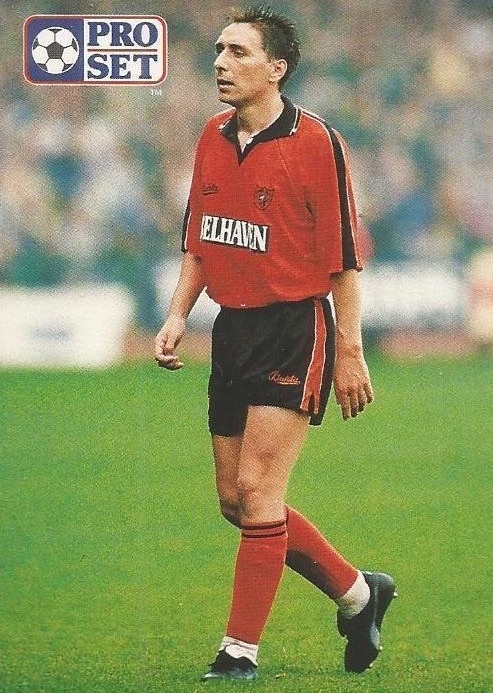 In the summer of 1992, Jim was selected for the Scotland squad to compete in the European Championship finals in Sweden, where he played in Scotland’s third game against CIS. Jim scored the decisive goal that took United through to the 1994 Scottish Cup final, beating Aberdeen 1-0 in the semi-final reply at Hampden. Having lost their previous three Scottish Cup finals, McInally, Bowman and Maurice Malpas finally collected winners’ medals when the team defeated Rangers to pick up the trophy for the first time in the Club’s history. 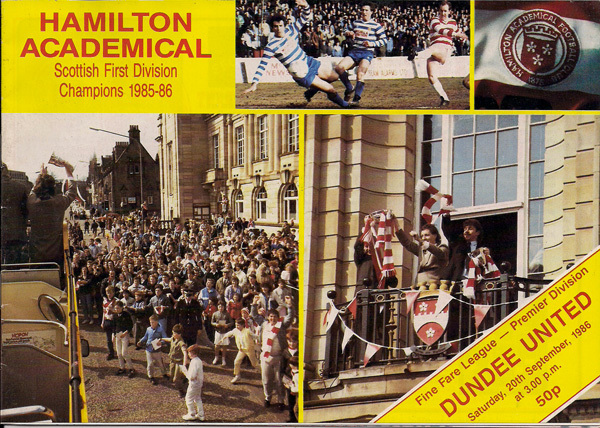 The highs of that Scottish Cup win were soon followed by the despair of relegation the following season, with McInally a regular in the side that dropped from the top division for the first time in 35 years. 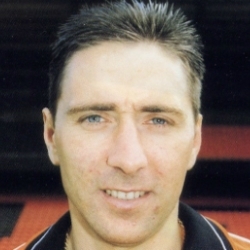 Having spent nine years at Tannadice, the midfielder was linked with moves to Motherwell, Celtic and Hibs before joining Raith Rovers as a player/coach in 1995. Eighteen months later he was back at Tannadice for a second spell, helping Tommy McLean’s side finish third in the Premier Division and qualify for Europe after their return to the top flight. 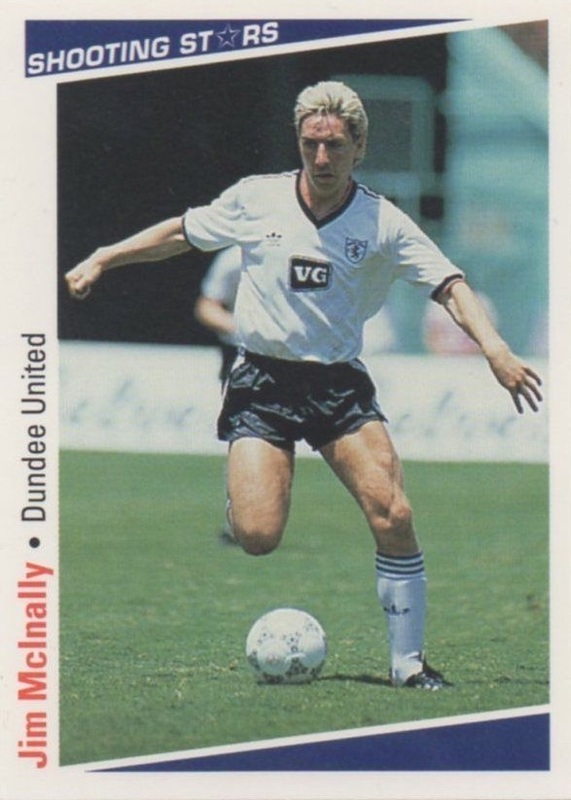 In June 1997 he joined Dundee as a player/coach, helping them to win promotion in 1998 before retiring a year later. His first venture into management followed at Sligo Rovers in the summer of 1999, but he quickly returned to Scotland where he joined Celtic's coaching staff. He became manager at Morton in 2004 and won promotion to the First Division at the end of 2006-07. In February 2008 he left Morton and a month later took over at East Stirlingshire, and in 2011 he took over at Peterhead, winning the Scottish League Two title in 2013-14. 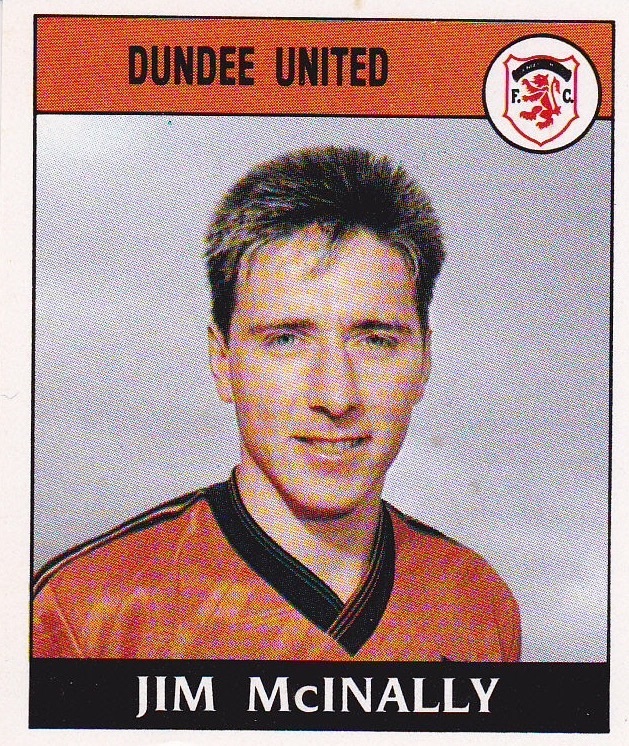 In 2015, Jim was inducted into the Dundee United Hall of Fame. We stretched our unbeaten domestic run to 11 matches this term, though this proved the least demanding outing against an Accies' side obviously lacking confidence after their dismal start to life in the Premier Division. It took us around half an hour to make the breakthrough. Gallacher was the architect of that first goal. His alertness allowed him to latch on to a McVeigh pass back and Kevin teed up the chance for Paul Sturrock to hammer in a low drive. The second came from a corner from which Paul Hegarty bulleted in a header to the extreme top right hand corner of the goal. A close run contest saw United edge home. After Kjell Olofsson had scored twice early in the second half, the dismissal of Erik Pedersen fuelled Fife hopes and they pulled a goal back through former Unitedite Harry Curran. However a late and neatly executed strike by Jim McInally ensured United chalked up their fifth successive league win. This was definitely not a case of saving the best for last as Scandinavian-less United suffered their heaviest defeat in what was undoubtedly the poorest performance of the season!